No one likes talking about bad things that could happen. However, as a homeowner, you have the responsibility to take care of everything within your property including the automatic garage door, which is the largest moving system in most homes. You should be well aware of the most serious problems which you can experience with it and of what you need to do to solve them while ensuring the safety of everyone in your family. Let’s begin. The good news is that this issue is not common. The bad news is that it’s bound to occur over a certain period of time as it isn’t possible to predict when a spring will break by looking at it. If a spring is broken, your door won’t open or move up extremely slowly. You just need to look at the springs to tell if one is broken. The first thing you need to do is to pull the opener’s emergency handle. Don’t try to open the door in any way as this poses a high safety risk. 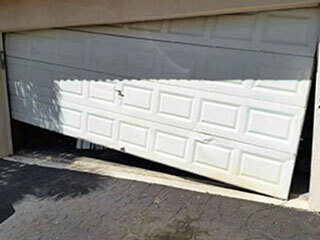 Rely on us, at Garage Door Repair in Stamford, to replace the broken spring fast. When the garage door motor stops working, you cannot use the opener to operate the garage door automatically. Sometimes, this happens because of a broken or damaged hardware component. Usually it means the main gear is snapped. The solution involves replacing the gear with a matching one. However, when the motor itself fails, the problem is a lot more serious. In some cases, repair is possible, but in others, it will require replacement. When a cable breaks, the overhead door can get jammed and the only solution to the problem is having it replaced. It is possible for the situation to get worse, before it gets better, however. Sometimes, the force released during the breaking of the cable, which is under great tension when the door is closed, causes the door to go off track. This is a dangerous situation which requires you to stay put and avoid touching anything. The repair involves replacing the cable, aligning the door and straightening the track, if it has got bent. You can actually prevent this bad situation by inspecting the cables regularly as part of maintenance. If you notice fraying or cuts, timely replacement will help you to avoid the serious problem. In either situation, you may be unable to close your door so emergency repair will be needed. Often, heavily bent tracks will require replacement just like their broken counterparts. There are ways to reduce the risk of track bending, however. Gravel driveways are not so common in Connecticut nowadays, but if you have one, you should check the tracks more often for pieces of gravel which could have got stuck inside. In general, if you notice any pebbles, dirt accumulations or other kinds of blockages preventing the movement of the rollers, you must remove them instantly. Make sure that the vertical and horizontal parts of each track are properly aligned and firmly secured in place.